Méta 141007 Frontispice Europe Labrousse 1800 © Coll. A.R. Publisher: LABROUSE grave par Jacques Grasset de Saint Sauveur ( Montréal 1757 – Paris 1810) Title: Frontispice de l’Europe. Published: Paris, 1800 16.0 x 11.7 cm.originalcolours. 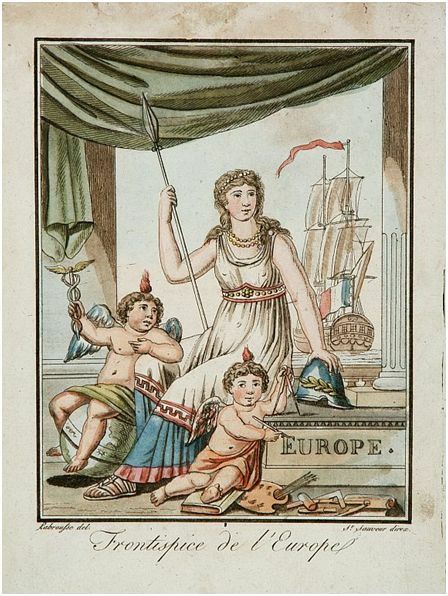 Decorative title page with heraldic figures and large ship with French flag.One putti sitting on a globe and holding the scepter of Mercury. Jacques Grasset de Sainte-Sauveur: A late eighteenth and early nineteenth century French (Canadian) artist, writer and diplomat, Jacques Grasset de Saint-Sauveur left Montreal in 1764 and began his studies with the Jesuits of Sainte-Barbe, in Paris. His first published book, Costumes civils de tous les peoplesconnus, dates from 1784. It deals with his lifelong passion of chronicling the peoples of other lands, particularly in remote areas. Hisotherworksinclude, Tableaux cosmographiques de l’Europe, l’Asie, l’Afrique et l’Amerique (1787), L’Antique Rome (1795), Encyclopedie des voyages (1796), and Voyage picturesque dans les autres parties du monde (1806). Of the engraver, Labrousse, little is known, except in relation to his engravings for Grasset de Saint-Sauveur. Besides being an artist and writer Jacques Grasset de Saint-Sauveur also led an active diplomatic career. He served as France’s vice-consul in Hungary and elsewhere. Today the art of Jacques Grasset de Saint-Sauveur may be found in the following collections; the BibliothequeNationale, Paris, the National Library of Australia, Auckland Art Gallery, New Zealand, and the New York Public Library.